The name says it all. No mixture compiled using various different lower quality proteins (concentrate, caseinate, etc. ), but only 100% pure whey protein isolate. It contains the lowest levels of carbohydrates, fat and sugars and is therefore ideal for any protein diet. Royal Green Whey Protein Isolate is also important to build fat free muscle mass and stimulates a quick recovery of muscle tissue. Whey protein isolate 99.5% (from milk, contains lactose), soy lecithin (less than 1% soy lecithin added to aid in product dispersibility). 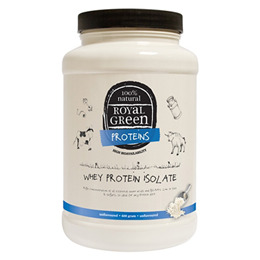 Below are reviews of Royal Green Proteins Whey Protein Isolate - 600g - Best before date is 30th June 2019 by bodykind customers. If you have tried this product we'd love to hear what you think so please leave a review. It's easy to drink with smoothie or soya yoghurt. It's suitable for vegetarians and it doesn't bloat. I'm happy with it to continue purchasing this organic product.